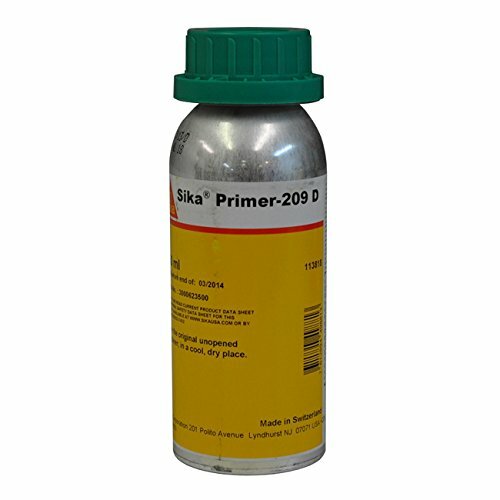 Sika Primer-209 D is a black, moisture-curing low viscosity primer specifically formulated for the treatment of painted surfaces or plastics prior to the application of Sikaflex direct-glazing adhesive. This product is suitable for experienced professional users only. Tests with actual substrates and conditions have to be performed to ensure adhesion and material compatibility. Due to the individual chemical composition of the formulations and specific furnace conditions, we recommend doing adhesion tests for each paint and plastic. Always seek the paint or plastic manufacturer's advice before using the primer on plastics that are prone to stress cracking, such as acrylics, polycarbonates or ABS. If you have any questions about this product by Sika Primer 209 D Polyurethane-Based Black Primer - 250ml Bottle, contact us by completing and submitting the form below. If you are looking for a specif part number, please include it with your message. PlastiKote T-236 Black Sandable Primer Enamel - 12 oz. SEM 42023 Beige High Build Primer - 16 oz.